Kienlen Ave & Dr. Martin Luther King Dr.
Every few months I visit Wellston, just to keep track of what’s going on. There’s been a lot of activity in the area over the last few years, with a considerable amount of new home construction and a handful of new commercial buildings. While it’s heartening to see activity in the community, I worry about the conspicuous lack of rehab and preservation, and specifically, the fate of the former State Bank of Wellston. 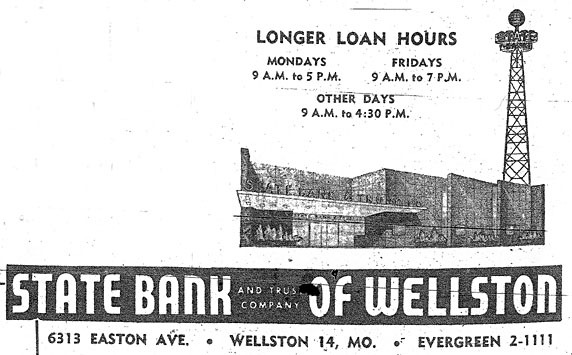 Sited a mere 1.5 blocks northwest of the St. Louis City Limit, the State Bank of Wellston was a flashy focal point of Wellston’s welcome mat status in the post-WW2 suburban migration. 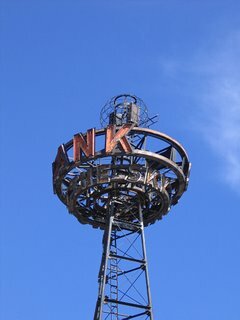 Erected in the late 1940s, the bank’s lighted advertising tower (above) was/is a notorious landmark. It looks like a cross between the old RKO Pictures Studio logo and a hipster alien spacecraft, which is also an apt description of the role Wellston played in the urban-to-suburban evolution of the St. Louis Metropolitan area. 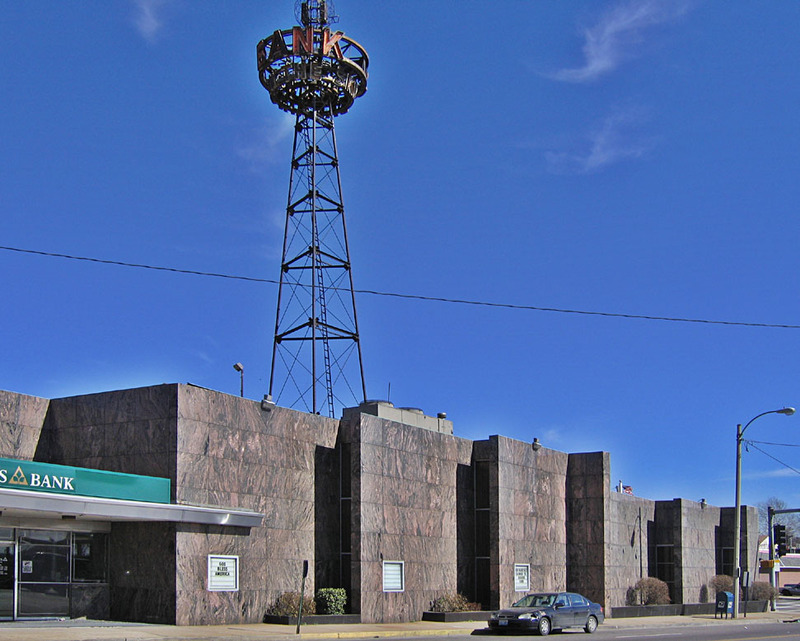 The advertising tower touts Sky Bank, which is was until the early 1950s when a new granite facade lent the importance required of an upgrade to State Bank. 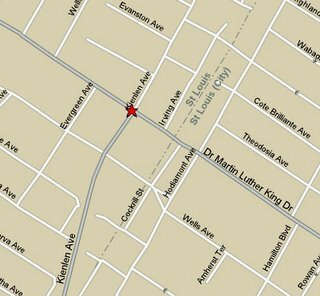 The 1955 St. Louis Directory ad (above) reminds us that Easton Avenue was long the original name of Dr. Martin Luther King Dr. That moniker peters out less than a mile from this intersection, when it becomes St. Charles Rock Road. When trying to recreate the 1955 directory shot, I couldn’t help but notice that liberties had been taken with the tower placement. But surprisingly, most everything else remains the same. In the early 1960s, the bank expanded and embraced the supremacy of car culture by adding an aqua supreme drive-thru-banking addition. 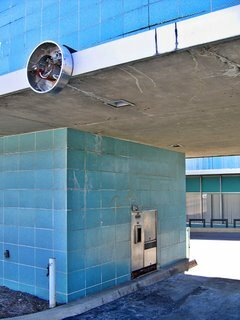 With the light fixtures that indicated open lanes long gone (above), I love that what remains looks like hubcaps. It’s both a sad and fitting commentary of what birthed and killed this now-abandoned drive-thru. 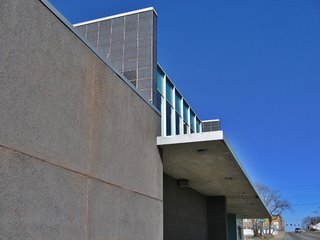 It is now a Regions Bank, and every time I photograph it, a security guard eventually comes out to kindly shoo me away. On this visit, the guard told me that the building had been sold in the late fall of 2005. Regions would build a new, larger structure across the street on Kienlen. I mused aloud to the security guard: While it’s nice that they decided to stay in this community, why do they need a bigger building when most banks are physically shrinking due to ATM- and on-line-banking? And who bought this building? And what will become of it? The security guard merely shrugged and made it clear I needed to stop taking pictures and just leave. Mindful of all the new activity, Landmarks has made steps towards an historical survey of Wellston, in hopes of making its city hall and developers aware of Wellston’s varied historical fabric. My hope is that rather than concentrating on the earlier era of this municipality, all decades of its story will be represented, with this bank being a beautiful example of mid-century city-to-county aspirations. Since it will no longer be a bank, it’s time to think about what else it could become: A bookstore or library (with drive-thru drop off book return! 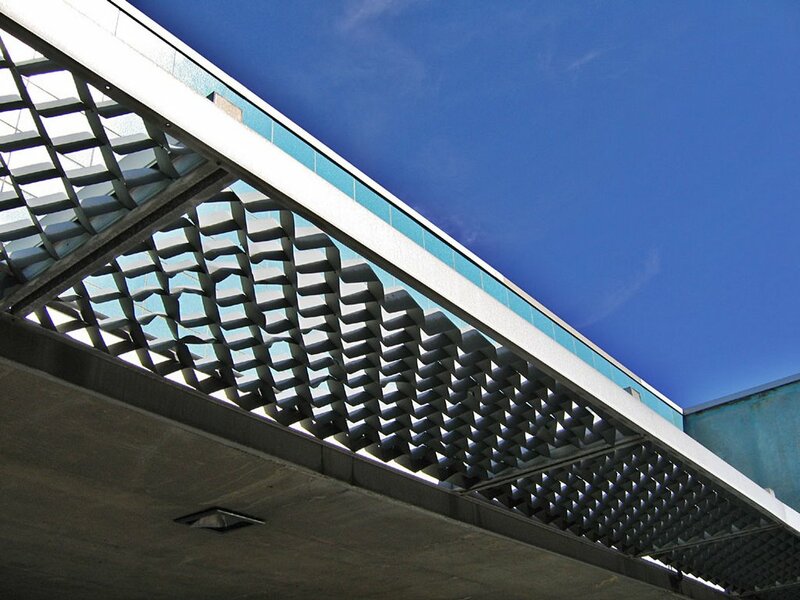 ); a restaurant and bar (imagine the drive-thru area as the coolest outdoor dining area)? 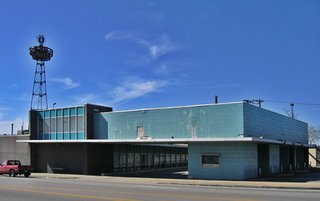 If Wellston were as sleepy as it once was, this soon-to-be-empty building could sit undisturbed for decades until a bright-minded person decided to bring it back to life. 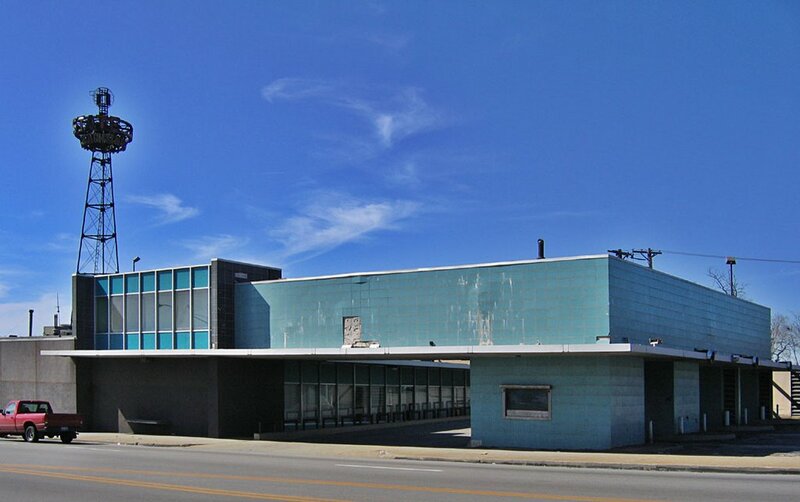 But Wellston’s on the move, and chances are this building will be demolished, because that’s what happens in St. Louis. 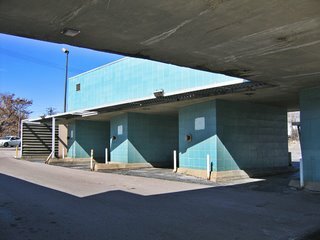 Plus, people have yet to be alarmed about the cavalier destruction of our mid-century architectural heritage. This bank is a choice example of such. 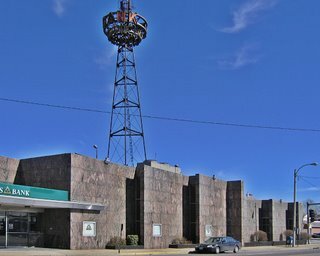 In from Chicago for the weekend I made a point of getting to Wellston and was so distressed and disheartened to see the State Bank almost gone. I grew up in Pagedale and opened my first bank account at State Bank. Made my first trip to Wellston in 1944 at the age of 4. In one Saturday afternoon I think my mother and I came across everyone we knew! By 5 I was at the Victory every Saturday for a Gene Autry movie, a Roy Rogers movie, a serial and cartoons, all in a riotous atmosphere overseen by patient uniformed ushers. My father was a streetcar motorman so I was well versed in all the lines which convened at the fabulous Wellston Loop. 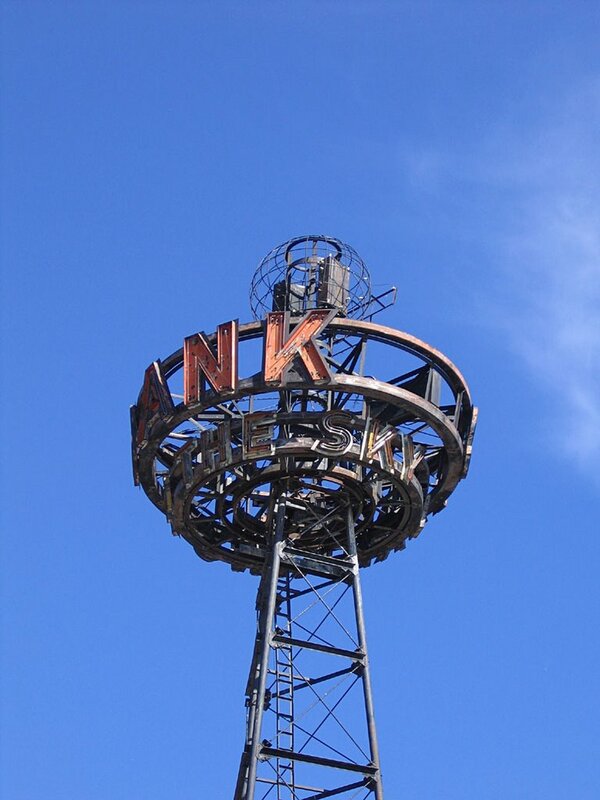 The neon tower is coming down the morning of May 16, 2014. Who will use it not confirmed just yet, but it will be saved. Drove by yesterday and it is all almost finally gone. Demolition is about half way completed. 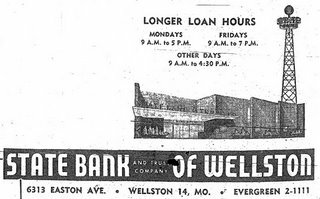 The Wellston State Bank sign is unusual and neat and needs tobe saved. Great article, thanks very much for sharing the information and insight. Your evaluation of the prevailing attitude towards preservation in this area is completely accurate. Anyone who requires confirmation of this needs only to look at the recent destruction of the former Bush Stadium in downtown St. Louis or the Northland Shopping Center in St. Louis County.